Chevrolet Camaro Handling Pros and Cons | Page 1 of 1 | Why Not This Car? What drives people to buy (or not buy) a certain car? TrueDelta's members share Chevrolet Camaro pros and cons based on their real-world driving experiences. Redneck Racecar? Not Any More! Car is too heavy to feel confident in the stock suspension. It is large, no getting around that but it handles very well for a big car. Due to suspension setup and tires, it grips the road much like my 08 Mazda Miata, but not quite. Handling is outstanding for a stock V6 car that retails for $23,000 to around $32,000 loaded with a 2LT,RS,moonroof,spare tire package. The has a smooth ride, but you can still feel the road. It corners even better than I expected and brakes wonderfully. I think it rates right up there with all the performance cars I have driven on the same roads, 1986 928s, 2000 Acura NSX, 2006 Z06 Vette. It is just the most fun of these. It handles the curves with ease, even at high speeds. 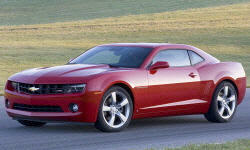 See TrueDelta's information for all Coupes and Convertibles.